After reading Rachel Wimberly's article on TSNN's website on incorporating video into trade show booths, she stated that a majority of them don't have video footage from their trade show. I am completely shocked by this statement because there are so many reasons video can boost traffic and sales at your trade show displays. There are 2 people that can benefit from the use of videos on the show floor: the trade show organizers and exhibitors. After reading countless articles and watching videos that were taken from conventions, here are a few reasons why you should always have a camera with you on the show floor. Nothing will attract more attendees to your booth than showing them why they should be there in the first place. Interview your staff and make sure to capture any activities you have at your booth (a preview of a presentation, games, magicians, giveaways, etc) If people can see with their own eyes what festivities are taking place, they'll be more prone to get in their car and drive to the event just to see your booth. Post videos while at the trade show by bringing a camera that can easily connect to a laptop like the Flip Camera. If you don't have a laptop with you, you can take them on your cell phone as long as you are able to upload them to the Internet. If you want to bring more exhibitors to the event, why not show them how they could benefit from promoting their business at your show? 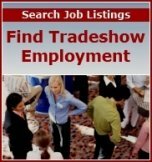 Interview other exhibitors to find out how they have boosted sales through the trade show. Also interview attendees to find out what they love about the show. YouTube has become the most uploaded website available, with billions of people watching videos on this website every day. It's a free marketing tool that will help promote your trade show exhibit or event and bring in a larger crowd.